The short answer to the provocative question posed in the title is, in all but a few rare cases, yes. But first, a quick caveat to prevent potential confusion. The discussion that follows focuses on the voluntary green power market where consumers pay a premium to their utility or some other company to claim they are receiving electricity from renewable generation. The findings that follow are not about government mandates and other policies such as Renewable Portfolio Standards, which can also utilize environmental markets and commodities. As some of you are aware, I have been researching the voluntary green power market for several years. The impetus for this research was a question that has created problems for years in corporate greenhouse gas (GHG) reporting and the carbon offset market. Should Renewable Energy Certificates, or RECs, sold through voluntary green power markets, be convertible to GHG emission offset credits? A decade ago, it was widely claimed by voluntary green energy proponents that RECs could be used just like offsets because they represented emission reductions. The logic went that switching to green power reduced your emissions by avoiding GHGs from fossil fuel-fired generation. At the time a number of companies coalesced around this marketing tactic, selling RECs as offset credits in the voluntary market. Even today, though outright claims of equivalence between RECs and offsets are less common, this line of argumentation can still be seen in the marketing language used to claim that participation in the voluntary green power market reduces emissions. Now, after more than a decade of research and analysis (by this author and others), the consensus on this question has finally pushed past the marketing spin. It is understood by a majority, or at least an influential plurality, that RECs are not the same as emission offset credits. I am not going to re-litigate that debate, as it has been exhaustively documented in the articles listed as references below.And we can also now say it has been empirically proven in two recent studies (Gillenwater et al. 2014, Gillenwater 2013). RECs are not offsets and the voluntary green power market does not reduce emissions from electricity generation. Green power accounting: A shift to contracts, or just contract shuffling? In this new decade, the debate has shifted to a more nuanced marketing claim: If, as an electricity consumer, you pay a green power premium, purchase a REC, or avail yourself of some other kind of green power contractual arrangement, you can claim that your electricity still comes from renewable energy and so your indirect emissions from electricity purchases (i.e., Scope 2) are now zero. In the language of green power marketers, you are buying renewable energy “attributes” even though how you physically receive your electricity has not changed. It comes from the same grid everyone else uses. So, what the heck is an attribute? Effectively, the claim is that these contractual arrangements for “attributes” allow you to bypass the power grid and virtually plug-in to individual wind farms. The claim is no longer that RECs are offsets. Instead, they are now a tool to virtually divvy up the generation supplying the grid so that a few companies can pick off and claim ownership to the green parts of the supply chain. 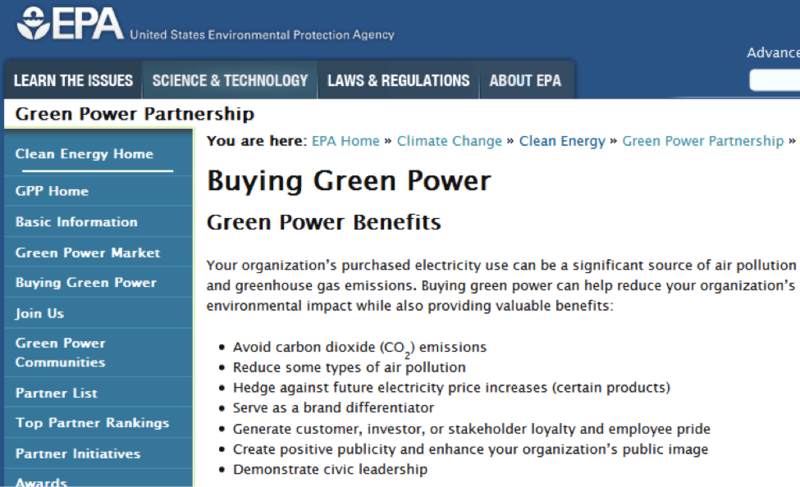 What is wrong with encouraging companies to pay a little extra that goes to support green power, such as what the U.S. EPA Green Power Partnership does? Clearly we want to encourage companies to reduce their emissions and transparently disclosure their GHG footprint. And maybe the voluntary green power market does not have an impact now, but if we allow it to grow, in the future it could. I recently had the opportunity to deeply ponder this question with a small group of sharp-minded colleagues. Our conclusion? For the purpose of voluntary corporate GHG accounting, the use of contractual approaches for attributing Scope 2 emissions from grid connected electricity purchases is fundamentally flawed and not credible. The problem with this approach is that emission factors based on contractual arrangements or REC purchases do not reflect the emissions actually caused by the reporting company’s activities. For all other reporting under the GHG Protocol, a physical relationship is presumed between a company’s activities and the emissions that result from those activities. This physical relationship is the basis for establishing a “true and fair” account of a company’s GHG emissions. A contractual approach to Scope 2 accounting breaks that fundamental relationship. It allows a company to lower its reported Scope 2 emissions without changing how it physically obtains electricity and without altering how electricity is delivered and sold into the grid. There is no evidence of any causal link between the vast majority of REC or green power purchases and the quantity of renewable energy produced. Physically, an entity cannot choose whether the electricity it uses from the grid comes from a renewable or fossil fuel source. Contractual arrangements do not change this physical reality. The problem here is bigger than just GHG accounting. We need to consider the implications of endorsing contractual approaches for attributional environmental accounting more broadly. Can anyone contractually buy “environmental attributes” for anything and adjust their environmental accounts accordingly? In an open voluntary reporting system this sets up a massive game of contract shuffling, leading to a meaningless reporting system. I think we are all strong supporters of policies and voluntary initiatives that promote expansion of renewable energy supply to electricity grids. But, I also strongly believe that environmental accounting needs to be rigorous, credible, and based on sound logic. We see no logical argument that justifies contractual approaches to Scope 2 or any other type of environmental accounting where it overrides physical linkages. If you disagree, we invite you to share your justification below or in the comment section of the Scope 2 open letter. It is important to clearly communicate that voluntary green power markets and those engaged in them are not ill intentioned. Just the opposite. These markets were developed and promoted with the hope that they would cause additional renewable energy investment. And most people engaged in the green power market believe they do or ultimately will. The problem is that green power markets, as currently structured, cannot achieve this goal. They were created on a fundamentally flawed foundation—that buying a virtual attribute can substitute for physically consuming a specific good or service. Further, the incentives of the participants in green power markets—power companies selling RECs, intermediaries marketing them, organizations certifying them, and companies buying them—are aligned, leaving no one with a strong interest in questioning the claims being made. With these concerns in mind, we are challenging everyone to question their own assumptions about voluntary green power markets. See Gillenwater 2014, 2008b, and 2008c for discussions on the interactions between compliance and voluntary green power markets. I want to again be clear that I am only referring to the voluntary green power market. This blog post does not address Renewable Energy Portfolio markets for RECs, which are driven by regulatory compliance demand. See the reference section for articles that discuss how these two markets are related. This conclusion holds for the vast majority of voluntary green power market activity. This conclusion, though, does not mean that there is not a rare renewable energy project, such as some solar projects, that can make a credible claim of additionality. The problem is that the voluntary green power market has no internal or external mechanism for differentiating from the roughly one percent or less of potentially additional projects and all others that are not (Gillenwater 2013). Also, while the U.S. voluntary market was the focus of this research, there is no reason to expect the conclusions not to hold for voluntary green power markets in other countries. Note: Please email info@ghginstitute.org to receive a copy of any of the copyrighted journal articles below. Brander, M. 2014. “The Enron of carbon accounting?” Isonomia Blog Post, March 7th, 2014. Gillenwater, M. 2014. “Further Reading on Green Power Claims,” Greenhouse Gas Management Institute Blog Post, March 12th, 2014. Gillenwater, M., Lu, X. & Fischlein, M., 2014. “Additionality of wind energy investments in the U.S. voluntary green power market.” Renewable Energy, 63, pp.452–457. Gillenwater, M., 2013. “Probabilistic decision model of wind power investment and influence of green power market.” Energy Policy, 63, pp.1111–1125. Gillenwater, M. 2013. “Redefining RECS: Additionality in the Voluntary Renewable Energy Certificate Market“, Doctoral dissertation, Princeton University. Offset Quality Initiative, 2009. “Maintaining Carbon Market Integrity: Why Renewable Energy Certificates Are Not Offsets”, June. Gillenwater, M., 2008a. “Taking green power into account,” Environmental Finance, October. Gillenwater, M., 2008b. “Redefining RECs (Part 1): Untangling attributes and offsets,” Energy Policy, Volume 36, Issue 6, Pages 2109-2119. Gillenwater, M., 2008c. “Redefining RECs (Part 2): Untangling certificates and emission markets,” Energy Policy, Volume 36, Issue 6, June 2008, Pages 2120-2129. I think this is of particular importance to the higher education community, specifically those of us who spend time thinking about how to move our institutions towards the aspirational goal of carbon neutrality since signing the American College and University Presidents Climate Commitment. I am not entirely clear on the current language, but I believe RECs are 1:1 for reducing scope 2 emissions under guidance associated with the ACUPCC. I would like to think that the higher education community would be more willing to look at this critically, and in particular not interested in claiming emission reductions that aren’t real. Thank you for your time engaging others about this issue. You may be interested in a group that is marketing a new type of environmental commodity as green power that is a little different. Effectively, they are claiming to be selling RECs that are additional. I discussed this idea back in my 2008 Part 2 article on Redefining RECs (link to article in References section above). I have not investigated their work, so I am not endorsing nor criticizing what they are doing. Only noting an interesting activity in the field related to this issue. A utility that invests in a solar array which feeds into their grid is not green-washing. It becomes ‘green-washing’ when they sell generic power from their grid to some customers at a higher rate (since these customers are told to think they are reducing emissions into the environment). There is no trade-able or marketable ‘credit’ to gain from the differential of the higher premium and generic electricity. So “green power at a premium” programs are: good, bad, not useful for GHG credit trading, or ___________? “Green power at a premium programs” result in no emissions reductions, but the solar power going into the grid does? I agree that the we are playing a sad “shell game” with green energy “offsets” in the US. CDM managed the challenge through rigorous validation of additionality. Though CDM was not perfect (and is now a market crippled by the lack of government leadership with the exception of the EU), CDM offsets truly did result in incremental carbon abatement. My big problem with CDM is that is it too complicated, expensive and slow. It is CRITICAL TO AVOID COMPLEXITY to promote green power because COMPLEXITY ENABLES THE “SHELL GAME”. In a country with our government and grid infrastructure, the best (simple) protocol would a federal mandate be to provide each power buyer the opportunity to purchase directly from green sources anywhere on the grid. The local power company would be mandated simply to account for the power consumed by each green power customer making that choice. In such a mechanism demand for local dirty generation is reduced and that should result in less carbon emission. Though one can get into technicalities about transmission losses (imagined or real), because the customer is contracting for green power at the price the green power producer sets to be viable, market forces would promote the growth of green power through a very transparent and direct purchase by the consumer. The money flows directly from the good consumer to the green power producer. The best way I can answer your question is to recommend you read the Scope 2 open letter referred to in this blog post, including the technical Q&A page. And further, read the references I cite. Unfortunately, this is not a topic that lends itself to concise simply answers. It is a topic that will twist your mind in knots. Having said this, the green washing is not on the part of those investing and building renewable energy. It is instead (and as I mention before, it is unintentional) downstream in the supply chain of the voluntary green power market industry that sells RECs and claims to green power as causing emission reductions and that you can virtually replace the grid power you get with purely green power by applying an “attribute”. By paying a premium you are making effectively a donation, but it is not one guaranteed to have any impact. And actually the evidence is that it does not have an impact. Green power premium program are “not useful” for GHG credit trading. This point is discussed in exhaustive detail in the cited references, if you want a far deeper analysis. When you talk about causing emission reductions, you first must establish a baseline and be specific about what intervention you are claiming is causing a change. So I cannot answer your second question as stated. I can say that government policies that promote solar power, in most cases, do result in emission reductions relative to a basline without those policies. If you are willing to pay tens or hundreds of dollars for a solar REC (and you check to be sure that money actually goes to the solar developer and not just to green power marketers, and that solar RECs were part of the project’s original finance) then that too most probably does cause emissions to be reduced. Very interesting topic Mr. Michael Gillenwater. I do agree with you. After noting the experience in developing countries like India and China, RECs and Voluntary/compliance GHG markets are two independent mechanisms, hence, buying RECs do not assure zero emissions for the buyer. For example, a solar power plant eligible under REC mechanism, trades RECs separately and also enrolls under CDM/VCS/any other voluntary carbon mechanism and trades issued CERs/VERs separately. To state clearly, the renewable attribute and emission reduction attribute of the solar project are sold separately to two different buyers. Hence, both cannot claim for the GHG reduction benefit, result in double counting. Very obviously, RECs represent only renewable energy portion of the solar power generation and no way can claim GHG reduction attribute. I feel this further helps strengthening your argument. Thank you for your comment. In response, I would go further and question your assumptions that there is even anything such as a renewable energy attribute that means anything in a voluntary context. As I outlined in my “Redefining RECs” articles, an environmental commodity that does not represent direct physical environmental impacts or changes, is not really meaningful. So the benefits of RE are only meaningful in what physical environmental benefits we can measure, quantify, and attribute to the RE activity. So, I would reject framing a discussion around the concept of “attributes” in general. I think that is a root of the error in logic underlying the voluntary green power market. Great article. RECs are, and have been for quite a while, what I consider to be “business as usual.” Therefore, presents a very fine and fuzzy line that leans toward green washing. A very well researched and insightful summary of the the issue of RECs versus VERs. About a year ago we published a similar white paper for IFMA. I would like to forward – how do I do that? I have not read your “Redefining RECs” article. However, my comments here are provided with reference to obligatory RECs and Voluntary emission reductions, considering as two different commodities, as exists in India. The obligatory REC buyers purchase RECs (which referred as Renewable Attribute) to meet their Renewable Energy Purchase obligation (RPO). However, they also started claiming the GHG offset as a by product of purchasing them, which I referred as double counting and an in correct practice. Whereas, RECs, on voluntary basis is debatable concept. In my opinion, it depends on the criteria what qualifies them as RECs. If the voluntary RECs, like, voluntary GHG reductions, have an additionality qualifying test and leads to addition of RE capacity over and above the ‘business as usual’ practice and with appropriate cross checking/controlling/verifying mechanism not to double count them, may be acceptable for such claim. Michael, Thanks for the interesting article(s). Since this is a complicated issue to talk/write/read about and as you said it twists your mind in knots, I’m offering what I hope is a simple and concise explanation from the Climate Action Reserve which addresses their reasoning for not crediting offsets from RE produced by dairy anaerobic digestion projects. This technology creates avoided methane emissions from manure management but also the collected methane is often used to produce RE. The Reserve does not give project operators offsets associated with the RE because these emissions are, “indirect emissions associated with power plants owned and operated by entities other than the livestock operator” (CAR Livestock Project Reporting Protocol v3, ftnt. 13, pg 14). Put simply even if zero emission electricity is put on the grid, there is no guarantee that high emission electricity is reduced as a result. Carbon footprint is a calculated quantity based on the amount of carbon moved from its current location (in the ground) , into the atmosphere, for human needs like electricity, transportation, etc. So, the carbon that was not moved from a coal seam or gas well to the atmosphere because of the wind power that was generating when the RECs were produced …… is still in the ground. 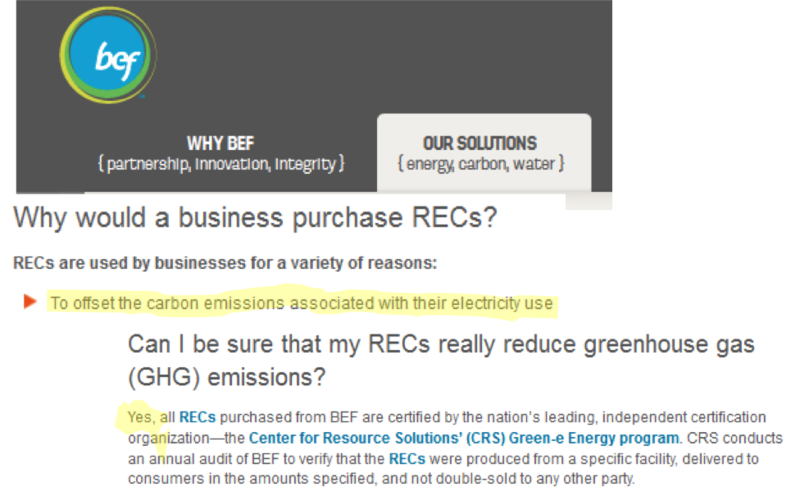 So, to lower my carbon foot print I must pay a fee (buy the RECs ) to keep the carbon in the ground? What if I don’t pay the fee, or nobody pays the fee, will the REC sellers release the carbon or will it just stay in the ground?